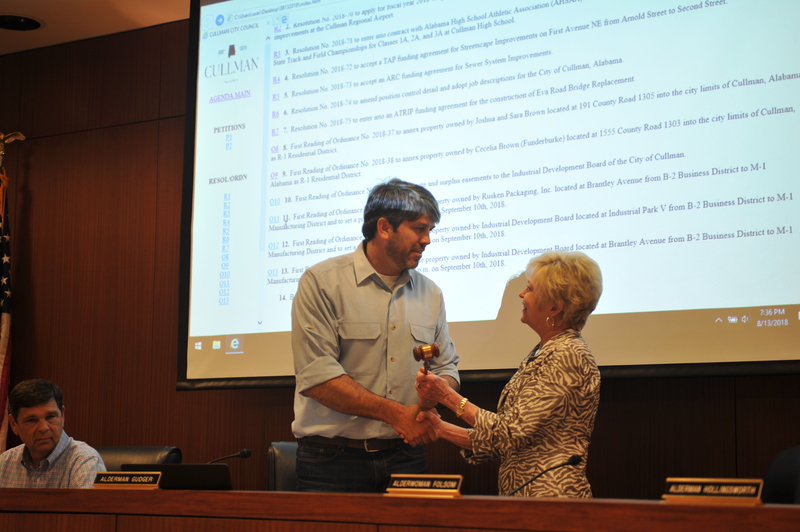 CULLMAN – The Cullman City Council has a new president. Longtime president Garlan Gudger, who was elected to the Alabama Senate's District 4 seat in the June 5 Republican Primary (there is no Democratic candidate in the Nov. 6 General Election), passed the gavel to Cullman City Council President Pro Tem Dr. Jenny Folsom, who is in her third term on the council. Councilman Johnny Cook has assumed the role of president pro tem. Folsom took a moment to express her appreciation for Gudger's years of service to the city. Gudger will assume his senate seat at midnight Nov. 6. During the meeting, two members of the Cullman Police Department were recognized for their recent promotions. David Nassetta was recognized for his promotion to lieutenant and Cindy Rohrscheib was recognized for her promotion to sergeant. – a special event permit for Oktoberfest beginning on Oct. 3 and ending Oct. 6. – a request from the Cullman County Bosom Buddies Foundation, for a special event permit to hold its annual charity motorcycle ride on Sept. 29 from 7:30 a.m. until 1 p.m. The ride is slated to begin at Cullman Regional. – Resolution 2018-70 to apply for grant funding from the Federal Aviation Administration and the State of Alabama to make improvements at Cullman Regional Airport. – Resolution 2018-71, allowing the City to enter into a contract with the Alabama High School Athletic Association and Cullman City Schools to host the 2019 and 2020 Alabama State Track and Field Championships for Classes 1A, 2A and 3A at Cullman High School. – Resolution 2018-72 to accept a Transportation Alternatives Program funding agreement for streetscape improvements on First Avenue Northeast from Arnold Street to Second Street. The agreement, including the local funds match by the City, comes to $800,000 to spend on the improvements. – Resolution 2018-73 to accept an Appalachian Regional Commission funding agreement for sewer system improvements. – Resolution 2018-74 to amend position control detail and adopt job descriptions for the City of Cullman. – Resolution 2018-75 to enter into a funding agreement for the construction of the Eva Road Bridge replacement. The agreement will be for $2,672,000 with a local match of $676,000. – Ordinance No. 2018-37 to annex property owned by Joshua and Sara Brown located at 191 County Road 1305 into the city limits of Cullman as R-1 Residential District. – Ordinance No. 2018-38 to annex property owned by Cecelia Brown (Funderburke) located at 1555 County Road 1303 into the city limits of Cullman as R-1 Residential District. – First Reading of Ordinance No. 2018-39 to vacate and surplus easements to the Industrial Development Board of the City of Cullman. – Ordinance No. 2018-40 to rezone property owned by Rusken Packaging, Inc. located at Brantley Avenue from B-2 Business District to M-1 Manufacturing District and to set a public hearing at 7 p.m. on Sept. 10, 2018. – Ordinance No. 2018-41 to rezone property owned by Industrial Development Board located at Industrial Park V from B-2 Business District to M-1 Manufacturing District and to set a public hearing at 7 p.m. on Sept. 10, 2018. – Ordinance No. 2018-42 to rezone property owned by Industrial Development Board located at Brantley Avenue from B-2 Business District to M-1 Manufacturing District and set to a public hearing at 7 p.m. on Sept. 10, 2018. The council's next meeting will be Aug. 27 at 7 p.m. at Cullman City Hall.